For religious reasons (the Ethiopian Orthodox Church observes a number of extended no-animal-products fasts throughout the year), Ethiopian cuisine includes a large number of vegan dishes. Hence, Ethiopian restaurants tend to be a pretty good bet for vegans. 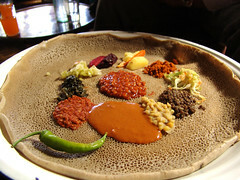 The photo on this page shows a selection of stews served on injera, a spongy flatbread made with a fermented batter. Pieces of injera are used to pick up and eat the stews. Last edited 2008-03-14 16:39:13 (version 5; diff). List all versions. Page last edited 2008-03-14 16:39:13 (version 5).